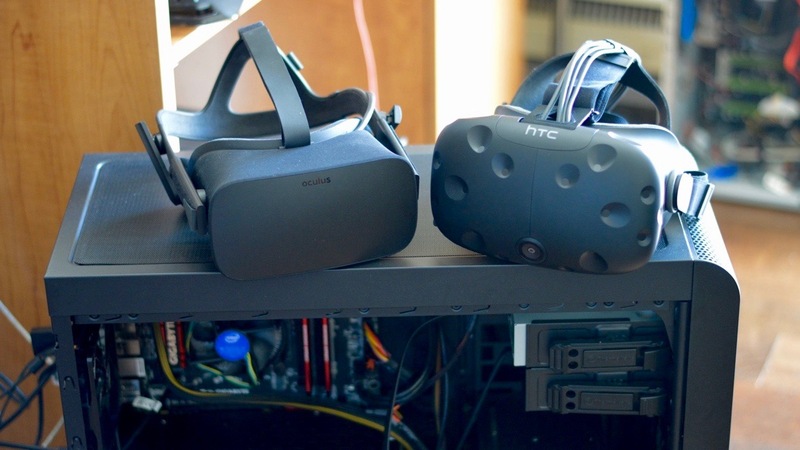 Many sites on the internet, like ones devoted to computers, have already spent much time to picking out the perfect parts for building a PC to run HTC Vive or Oculus Rift. But not everyone is an enthusiast and building your own PC can seem daunting. While I love PC games, I've never built a rig myself for this very reason. After much internal debate, I decided to buy the parts and put a PC together instead of buying a pre-built system. Though Oculus has harped on about the affordability of its PC partners, I still didn't feel like forking over another large sum of money in the name of VR. But if you feel the compulsion to jump right into VR without spending extra time on building a PC, there are decent prices for pre-built units which I've also included below. First off, make sure you know what you need. Thankfully both Oculus and HTC/Valve have lists that you can refer to - and with a few slight differences, the PC you pick or create should have no problem running either headset. The parts below aren't top of the line but they'll definitely be able to transport you using a Rift or Vive. The recommended CPU and GPU are a bit older so it doesn't hurt to upgrade to an i5-6400 or equivalent but it will cost you a bit more. Getting a GTX 980 or AMD 290X will also run you couple hundred more - or you can save up for the GTX 1080. It's the latest Nvidia graphics card that boast high performance for a lower price than Nvidia's other high-end GPUs. However AMD's just released its own powerhouse, the Radeon RX 480, at a ridiculously affordable price point which is why it made the list below - but only as an alternate since it may be hard to find right now. Note: The list below isn't what I built. Since I figured I would be using the PC for more than virtual reality headsets, I didn't want to completely build a budget machine, but I did put together the cheapest option I found after hours of researching. I also had some parts on hand from an older rig which helped alleviate costs (so it might be useful to rip parts off your older machines if you have one and are feeling up to it). Also of note: Sales and deals for PC parts are always fluctuating so the prices below may not match anything tomorrow or even next week. The steps listed aren't necessarily comprehensive and you may do it a little differently. It's really a matter of following directions that come with all the parts and finding out the easiest way to install them. This is what worked for me. A screwdriver and a flashlight or good lighting helps to see everything. Scissors will help to open the boxes - and that's about all the tools required. You'll mostly need a considerable amount of space. There will be boxes, papers, screws and plastic everywhere. Perhaps some sweat and tears if you can't figure something out. But don't fret, that's what years and years of PC building forums are for. I started by installing the PSU (power supply unit) into the case. A screwdriver was needed here to make sure everything fits in securely. I've seen PSUs on the top left or bottom left corners before - consult your manual on the placement. Leave the wires hanging out so they don't get in the way. The CPU and RAM are much easier to install on the motherboard before you secure the board to the case. You have more room to move your hands around if needed. I learned the hard way that the processor is tricky. Most CPUs come with gray thermal paste already on the unit - don't touch this. It cools off the CPU and works as a conductor. There should be pins that you shouldn't touch at all as bending them will make sure you won't get to use any VR headsets (or the computer at all). Gently place the CPU on the socket - pay attention to what direction it goes down. There should be labels on the motherboard. Next, secure the load arm. I think I'm scarred most by this part. You have to push down really hard so it clicks into place and locks. There might be a lot of resistance and sounds metal on metal shouldn't make, but push the sucker down. After that, if your CPU came with a fan, plug it in over the processor. There should be four holes that it connects to after which, you tighten on the back of the case. There should be a four pin connector on the motherboard that the fan's wire pins goes into which you can plug into. Once you've got the CPU fastened (yes it will work if you didn't bend any pins), plug in the memory. This installation is pretty easy. Since you need 8GB to run Rift and 4GB to run Vive, why not go the extra mile and do 8GB? It will also help future proof your rig for upgrades later. Each stick of memory has a notch in the contacts on the bottom that lines up with a block in the memory slots on the motherboard. Holding it right above the slot with the two lining up should tell you it's facing the right direction. Stick the sticks into matching color slots as well (likely A1 and B1). Since there are two, the motherboard will be reading them as a dual channel configuration boosting memory performance. Lastly, push the wings up on the top and bottom to lock them in place. Placement of the motherboard depends on the case. Since the motherboard panel (the USB, VGA, Ethernet ports) needs to align with wherever there's a cutout, it may need a little finesse. Some cases also may be too small for the board (or long GPU) so make sure it's able to fit everything. The screwdriver makes an appearance here too. Hand turn the screws then use the tool - but don't over tighten the board to the case as you might crack it. Remember the cords from the power supply? Those are back in play. It can get confusing but you basically match the pins up to the ones on the board - the wires are labeled on most PSU cables and even on the motherboard. You can also run the cords through the back of the case if they're long enough. Most of mine weren't so the inside looks a bit tangled though I've seen really nice builds where everything is hidden making it much neater. This is especially cool if the side panel is clear so you can see inside. The graphics card is just as easy as installing the memory. This goes right into the long slot (called the PCI express slot) on the motherboard. Measure up which back plating on your case will need to be taken off - because the GPU panel will stick out the back - and remove it. Usually two need to be taken out to fit. The screws will be needed here to affix the card properly to the case after you've slotted it into the motherboard. Find the connectors from the PSU and push them into the power connector on the outward facing part of the GPU - the cords are usually the ones with 6-8 pins. Newer, higher performance cards likely require two connections. Most cases have cages or cradles on the right hand side where the hard drive goes with pricier cases offering up tool-less removal. There's also different types of storage you can buy now with each offering up a slight change in installation. 3.5-inch drives, which are the spinning data disks, are larger and don't require much work other than slotting it in then plugging the power and data cords in from the PSU. Smaller 2.5-inch SSDs sometimes need adjustments to the brackets so they fit better. Otherwise they slide into a smaller slot that can be found near the larger slots. Finally! You've plugged everything in and the computer is actually whirring and running without any problems. Now you can install Windows by plopping a disk into the optical drive or plugging in a USB. Follow the prompts and make sure you update everything. I had issues with a fresh version of Windows and installing software from Oculus. There are certain updates that need to be completed beforehand so make sure that's taken care of. All the parts listed for this build total $634.45 which isn't too shabby considering the cost of pre-built systems. There are a few additions that you may have to spring for that aren't part of the list above because they are optional and shouldn't impact the overall price if you already have them. Optical drives aren't totally necessary but annoyingly, it may be a requirement if you're installing Windows fresh. The other option is to install via a USB flash drive which could save you $20-$50. You may also want to install a CPU cooler or extra fans - but these aren't really necessary if your chosen case and CPU have fans included. Connecting to the internet with an Ethernet cord can be a hassle so a wireless adaptor may be needed. This shouldn't cost you more than $10 unless you want a really fast connection in which case, you're looking at $15 and up. If you don't have a monitor, mouse or keyboard, you'll need to spring for these too. It's not possible to set up the headsets without these peripherals. Luckily there are tons of options out there that shouldn't set you back too much. A monitor would be the most expensive but you can definitely find one for under $100. Nice headphones like ones from Ossic may add to your VR experience if you want something more immersive than the Vive's earbuds or Rift's built-in headphones. However, Rift's audio is spot on so if you decide on buying Vive, a nicer set of cans may be needed. Lastly, when setting up Oculus Rift or HTC Vive, you may need an extra cord for your monitor since the headset takes up the HDMI port - but this should only cost $5-$10. Most PCs from manufacturers like Asus or Alienware are doling bundles for both a headset and tower starting at $1500 or more but there are other options that let you pick only a PC. The ones listed below are mid-range towers that can handle VR (and then some) if you're not looking to build your own. Building my own system was both frustrating and incredibly fun. I had few issues with plugging the right connectors in - my power button wouldn't work at first - because they're really tiny and hard to see. But once that was fixed, arriving at the moment of truth where everything finally lit up properly was euphoric - like beating the final boss of a game after dying 10 times. There was much maniacal laughter when I heard the fans whirring and saw the lights turning on. Of course, installing everything and waiting for updates is a huge pain, but totally worth it. Every day I use it (I've dubbed the rig Boudica the Beast), the VR experience is even better knowing it's working because I put it together myself. Here's hoping it won't break for awhile. Have you built your own PC to use with a VR headset? Let us know how you got on (plus any tips) in the comments.